When it comes to delicious easy-grow crops for the garden – it is hard to beat growing turnips from seed! Turnips are a great addition to any garden plan. This ultra-nutritious crop has been grown around the world for thousands of years. And, it continues to be a popular garden crop today as well. Turnips germinate quickly, and require little maintenance other than thinning and weeding. And perhaps best of all, they can be harvested in two unique ways. One, as a traditional root or bulb that is perfect for soups, stews and more. And two, as tender greens that can be prepared much like spinach or broccoli. Both turnip bulbs and greens are loaded with vitamins. In addition, they are excellent sources of iron and calcium as well. Turnips thrive in the cooler weather of early spring and late fall. Because of this, it is quite easy to grow 2 separate crops. When growing turnips, it is best to sow seed directly into the ground. With their quick germination, and difficulty in handling the transplanting process, seeding is a better way to go. Growing from seed is the best choice for turnips. They do not survive the transplanting process well. In the early spring, sow seeds around 2 weeks before your areas last average frost date. For a second fall harvest, sow in late summer, allowing for at least 6 to 8 weeks before your average fall frost date. Amend soil with generous amounts of compost before planting. As a root crop, turnips prefer loose, well-drained, fertile soil. If you have clay-based or hard soil, you can add in a bit of sand as well to help allow roots to grow more easily. Rake the area smooth before planting. Seed should be planted shallow, at around 1/4″ in total depth. Plant to a depth of 1/4″, covering lightly with loose, fertile soil. Sow at a rate of two to three seeds per inch. This allows for both good germination, and additional plants that can be harvested as tender greens. Two excellent varieties to grow are White Globe Turnip Seeds and Purple Top Turnip Seeds. Once seedlings become established after a few weeks, plants can start to be thinned. The thinning allows the remaining root bulbs to mature to full size. And, the plants removed make for excellent tender young greens! Fresh, tender turnip greens are not only delicious, but extremely nutritious. Plants should ultimately be thinned to 4″ between plants. You can actually perform the thinning process over a few weeks. It is a great way to keep a steady supply of greens on hand. Turnips are actually one of the easiest crops to maintain once planted. They require little to no additional nutrients to reach their full growth potential. Keep rows weed-free to allow for the bulbs and greens to reach their maximum growth. Turnip greens can be harvested at any point. The roots can usually be harvest from 5 to 7 weeks for early varieties, and starting at 8 to 10 weeks for later maturing types. 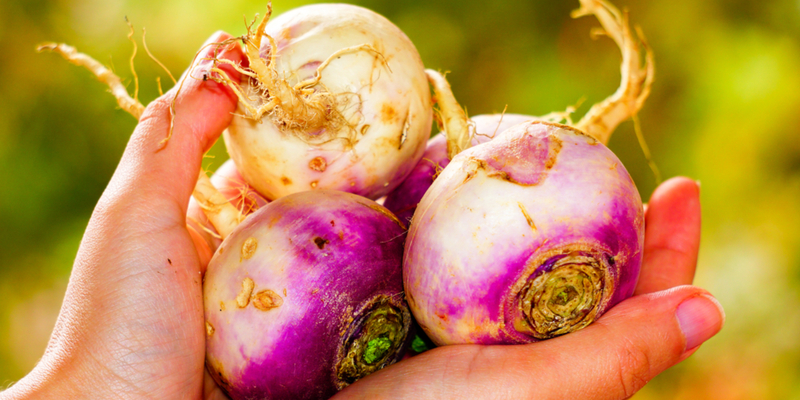 Turnips can be harvested at any size once the roots have formed their bulbs. They can be pulled from the ground at nearly any size. They also store well in the ground, so you can harvest as needed. Turnips can handle a light frost or freeze in the early fall, but should be harvested completely before a hard freeze. They will store well in a cool dark place for 3 to 4 months after harvest. May 16, 2018 TIMG Comments Off on Growing Carrots – How To Plant And Grow A Great Crop! July 25, 2018 TIMG Comments Off on 3 Simple Ways To Eliminate Weeds From Flowerbeds – For Good!